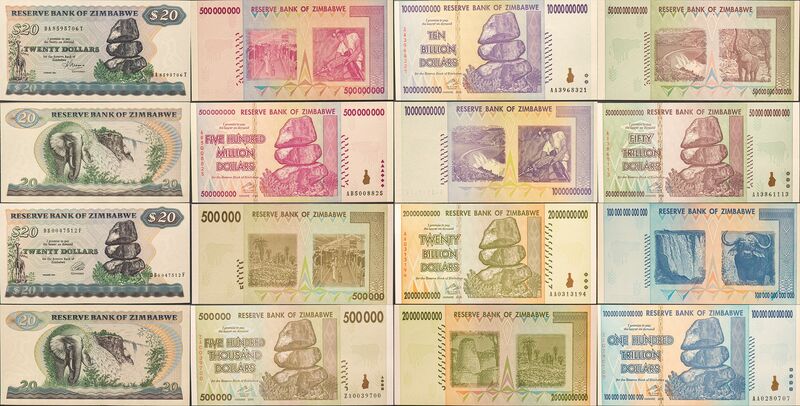 When the set was introduced around 2016 the Zimbabwean First Dollar Set Category (“1980-2004 Issues, P1-P12, Complete”) included slots for all the sub-types, so instead of a slot for P-4 there were 4 slots for P-4a, P-4b, P-4c, and P-4d. They later went back and reduced the set to just 12 slots – one for each pick #. I can only assume NGC decided to do this on their own because I don’t think anyone other than myself has ever had a set in this category so it’s hard for me to believe that someone else (a user / member) asked for or recommended this change. I made my set back in 2016 when they were first introduced to the registry. I went about two years without updating or adding to it after that – fatherhood and unemployment sucking up my time. So I didn’t notice the change in the set / slots until about two months ago when I started paying attention and building up the set again. Honestly, I like the change. It makes the set a lot more approachable and significantly easier to build – which was probably what NGC had in mind when they made the change. Collecting a full set of the pick #s for the first dollars is easy enough but building a set with all the sub-types would be expensive and hard. In particular, the 1980s notes that list the name of the Capital city as Salisbury instead of Harare (they changed the name of the city in 1982) seem hard to find. They just don’t seem to pop up very often. Now, since I just need a P-11 and I don’t have to care about it being a P-11a or P-11b – unless I want to. The set becomes easier to build – and a lot more fun too if I’m being honest. The whole thing just becomes less daunting. This change did hit my set a bit in that I’d bough both a P-4c and a P-4d at a time when they could both be listed in the same competitive registry set together. Now you can’t do that – not with a competitive set. But you can do it with a signature set and that’s exactly what I do these days. That is, after all, the beauty of this place with the signature sets. My P-4c and P-4d are both in my newly re-done and re-imagined signature set. I may yet have more instances in the future where I have more than one sub-type within a single pick. I think getting some things like that has a great potential to add depth to the set and strengthen it, but it’s great in a lot of ways to feel like I don’t have to. Part of the impact of this, at least to me going forward, is that it makes getting a new pick # that I don’t have an example of a lot more appealing than getting, say, a P-5b when I already have a P-5a in a comparable or better grade. I could definitely be interested in one day getting as many of the different sub-types as I can, but I think that will mostly wait until after I’ve acquired what I want and can find of the different pick #s.